You’ve been with the company for 17 years. Can you tell us about your career path at VMAC? Before working at VMAC, I was an Electrical Engineer and Contracts Manager in the UK. I began working at VMAC as a Systems Support Engineer, focusing on the maintenance of systems in production. I was responsible for ensuring information flowed easily between our engineering and production teams. Then I was promoted to Senior Product Engineer. This position was particularly memorable and interesting as I was able to work closely with Lincoln Electric’s engineering team to develop an OEM solution that would meet their unique needs. 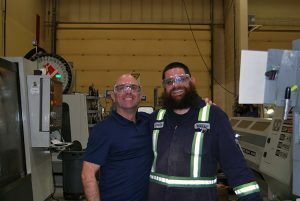 My team and I focused on UNDERHOOD™ air compressors, and I gained a unique perspective on interdepartmental interactions and processes. Next, I worked as a Quality Engineer, focusing on product quality and process improvement, before being promoted to Quality and Engineering Manager, responsible for all quality and engineering operations. My most recent role as the Director of Operational Excellence was a great next step in my career, allowing me to further help optimize the overall efficiency of the organization while fostering a positive work environment. I have recently been promoted to Director of Operations, which allows me to combine all my past leadership and production management experience to direct, execute, and plan the company’s manufacturing operations. See VMAC’s press release on Stuart’s latest promotion to Director of Operations. What accomplishments are you most proud of during your career here? Well, you might have to ask others what they think, but I would say I’m most proud of the relationships with my coworkers, customers, and vendors that I’ve been able to build throughout my time at VMAC. My various positions have given me a unique perspective on interdepartmental interactions and processes. I’ve been able to grow and develop with the organization, and I hope to be able to provide leadership and give back to VMAC. Looking forward, what’s next for VMAC’s operational development? I see a lot of opportunity to move forward with our Lean systems and continuous improvement journey. The future is bright at VMAC and I know we will continue to deliver a world-class product to our customers, which is our number one priority. I’m sure you’ve seen a lot of changes throughout your time at VMAC—are there any that stand out? Perhaps the most obvious change I’ve seen is the growth of our team. When I started, there were about 25 employees, and now we have over 100 team members. The culture that was fostered by our founder, Tony Menard, and preserved by President Jim Hogan is what hasn’t changed. I’ve noticed that people here are invested and engaged—people want to do business with VMAC, and coworkers want to work here. Though we’ve expanded significantly, at the core we’re still a tight-knit team striving for continuous improvement. It’s hard to pick one favourite memory, but I always look forward to our annual Christmas party and social events. We have an enthusiastic sense of comradery at VMAC, and I love how everyone pulls together to help each other out. Is there anything else you’d like to include? I’m honoured to be VMAC’s Director of Operations, and I hope to meet the high expectations that everyone has for our organization. I look forward to helping VMAC continue to grow the way it’s expected to.